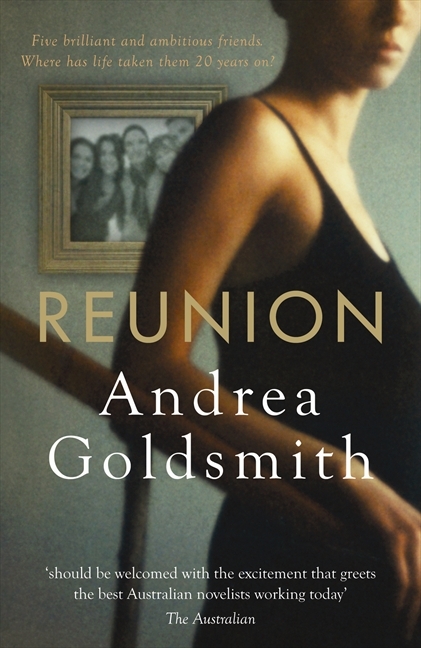 I wanted to love Andrea Goldsmith’s Reunion. And I expected to, as I remember enjoying the last book of hers that I read. But, somehow, I found it a bit of chore to read, though it did pick up towards the end. I think I understand why it was not listed for the 2010 Miles Franklin Award. Friendships become swaddled in invisible protective layers and nothing short of a cataclysmic blow can break through to the inevitable stress points beneath. The plot is fairly straightforward. Four university friends (three students, borderline baby-boomers and now in their mid-40s, and a lecturer, now around 60) find themselves all living in Melbourne again after some 2o years apart. All four had met in Melbourne, had moved together to England to continue studies and work, but had then gone their separate ways. At the beginning of the novel Jack, an academic and Islamic expert, is single and still in love with Ava; Ava, a novelist, is married to the unpopular Harry; Helen, a scientist, is a single parent; and Connie/Conrad, a philosophy lecturer, is on his third marriage but still philandering. Harry, who met them in England, is on the outer, but it is he who has engineered the reunion under the auspices of an organisation he has created, NOGA (Network of Global Australians). The novel, then, is about this time of reunion: it explores who they are now, and the state of their relationships with each other. Sounds like the sort of thing that would interest me – Melbourne setting, characters with whom I would expect some level of identification, themes exploring love and friendship, and a writer whom I’ve enjoyed before. None of these, I should add, are essential for my reading enjoyment – I also like books set in exotic places and about very different characters – but familiarity often appeals too (doesn’t it?). And yet, for me the book fell a little flat. It just didn’t feel quite original enough – in either ideas or language. It felt a little same-old-same-old. That said*, I found the characters interesting and convincing, although only one, Jack, changed in any significant way as the novel progressed. The narrative mode is multiple 3rd person subjective, with Jack’s perspective starting and ending it. It is told, chronologically, but with flashbacks to fill in the past. All this is well controlled and keeps the story moving nicely. Goldsmith ranges across a lot of themes – love and friendship (of course); truth and fiction; secrets and memory; passion and obsession; modern communications; revenge and forgiveness; and science, ethics and politics. It is probably here that the novel palled most for me because many of these themes seem to go nowhere. Take the truth and fiction one. Those of you who read my blog know that I enjoy seeing this issue explored, but in this novel it’s raised, often with a nice level of irony, but is not really developed. For Ava, the novel writer, “there was no better vehicle for truth” than fiction, whereas for the scientist, Helen, “Ava’s work is only fiction – none of it is true”. Well, I thought, Goldsmith will unpack the ironies contained in these, but she doesn’t really. Perhaps that’s OK, perhaps it’s enough for us to notice them, but I wanted more. Whenever Jack looked back to his university experience and compared it with today’s university student life, so much seemed to have changed – even friendship itself. Without computers and mobile phones, face-to-face communication ruled the day. The implication is that modern friendships are somehow less meaningful, but what does he really know and, further, what does the novel show us about it? Nothing really. Similarly, Helen rages about political interference in science, but the issue, while valid enough, seems a little fabricated in the context of the novel. There are some funny set pieces, such as the young television make-up artist trying to hide Connie’s aging neck. Goldsmith does irony well – something I, as a Jane Austen aficionado, rather enjoy – and she peppers the novel with a lot of effective literary allusions – to Waugh, Wharton, James, and others. Moreover, there are some lovely descriptions, such as this one on Ava’s discomfort during her first weeks in England: “It was like being stranded on a sheet of clear glass with nothing but blackness underneath”. I’m not sure why I like this, but I do. I’ve struggled to write this review, really, because there are things to like about this book. I decided to do a quick review of reviews out there and what I mostly found were positive reviews that each had some little reservation: “despite that minor misgiving”, “a rich and at times frustrating novel”, “despite a few stylistic glitches”, and “the novel was marred but not spoiled for me by …”. None though explored these reservations in any depth. The truth can hurt. But that doesn’t make it less right. The final irony is that Harry is hurt by a truth – but the truth he is hurt by and the real truth of the matter are two quite different things. And that, in the end, made the novel an interesting if not totally engaging read. For a more positive perspective on this novel, check out Lisa’s at ANZLitLovers. *See my previous post on words to avoid! Funnily enough, as soon as you started describing this I thought that it didn’t sound too original (this could have something to do with my having worked at a mainstream bookstore and seen a myriad “groups of mid-age women/friends coming together again” novels on the shelves). Which is not to say that such novels can never be well-written! As member of “today’s student university life”, I prickle at the implication that non-face-to-face contact is lesser. But so should all we bloggers and people reading this – I have met some amazing, amazing, to-speak-in-cliche-soulmate-esque friends through my blog, and most of the time when I text or Facebook my “real life” friends, it’s in order to organise meeting up face-to-face! Aww, I liked this, Sue! Maybe it’s a Melbourne thing LOL? Oops, Lisa, I meant to provide a link to your review as I remembered that you’d liked it. I really was tired last night! Anyhow, I’ve added the link now. WC: Agree totally (of course – how can a blogger not). Lisa: I did wonder whether it might be the Melbournites supporting their own (LOL), because of my 5 reading group members who read this only one really liked it and the other 4 of us had reservations, all fairly similar to what I’ve said above. BTW did you get two notifications of this post? I drafted half of it before I went out last night and then in my tiredness later on I managed to hit Publish before I was ready. Rather than keep editing it and have people see it in various states of disrepair, I immediately deleted the post and pasted it back into a new post, but I think the deed was done! I’ve done that a couple of times. Teach me to play with computers when I’m tired eh? The book sounds like it has a lot of potential. Too bad it was a bit disappointing overall. I hate when that happens. Right on both counts, Stefanie. It was hard to say exactly what it was really but I realised when I was about 10% or so in that I was feeling a bit bored. Pinpointing exactly why that was proved much harder because the characters were interesting and there are lovely ironies. Oh well, c’est la vie, eh? I’ve made some awful bloopers posting things when tired…sometimes I look back at a post and see all the grammar and spelling mistakes and could kick myself! Oh good … I have a feeling the email subscribers might have got both but they aren’t the bulk I think. It is a lesson though not to work late at night! I’ve found a few typos etc later too … irritating eh? Do you draft in WordPress or separately. Sometimes I think I should draft elsewhere and past it in when I’m close. FYI, I always draft in Word and cut and paste into WordPress. Word, for me is a much better editor. Actually I try to have it nearly ready to go before I put it in WordPress. Thanks Tony … I wondered if many do that. I might consider it. Do you do a direct copy and paste or do you need to go through that Insert from Word option? Does it make a difference? I love the way you wrote this review – and how clearly you articulated why you liked the novel just fine but didn’t LOVE it, it didn’t speak to you and move you and while it raised curiosity, it didn’t answer those questions or fill in the gaps. In the US, we just had the LOST finale, a show that may be popular around the world too and the ONLY TV show I watched….well the Finale hardly answered all the questions raised from time-travel to physical phenomena and eternal youth and tons of other strange happenings that people watched over 6 years (I watched it consumed in one summer month, ha!) but the ending was emotionally satisfying for me so I was fine. In reading books, though, I sometimes struggle with your challenge here – I want more and the author just doesn’t explore those corners. Nonetheless, your writing voice is the reason I read your reviews. Why thankyou Farnoosh. It is sometimes hard to get just the right voice – I think I’m still trying to work out how formal and how informal I want to be, for a start! I’m glad that this review worked – from your response it is clear that you got my point. I don’t mind open endings at all – and this one had a pretty open ending which worked fine I thought. The problem had more to do with the ideas raised along the way that seemed not well integrated. (BTW LOST was very popular here too but I only saw the first episode or so. My daughter watched the first season but then her studies got in the way. I do watch a few TV shows, but with my laptop on my lap – multitasking (!) and so I don’t follow them properly which is why I related to your “slow down” post!). It sounds obvious, which is a fairly serious flaw in a novel that doesn’t have some other merit (usually a non-literary one). The quotes too don’t really zing for me, particularly the computer one which as you say is stereotypical and really just betrays no great insight. If it’s followed up by something, fair enough, but since it isn’t it’s just a middle aged platitude of the sort the older have been saying of the younger since we left the caves (if not before…). Ah well, not every book can be a winner for every reader. Yes, I think that’s it – it’s pretty obvious and the language just doesn’t zing enough (for me either). I did generally like the characterisation though – if that makes sense.